These all new 'Honkin' Tom's' branded tweed amplifiers are the real deal, make no mistake. This amp is a tone monster for the player searching for the sounds and style of a bygone era. 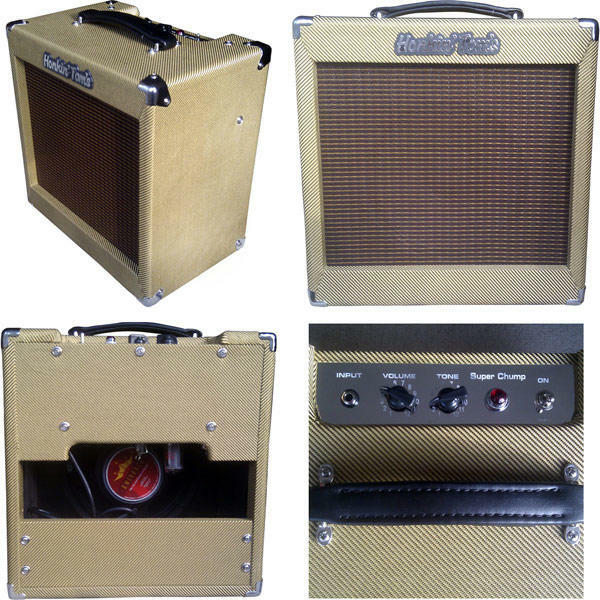 Based on the legendary Fender 5f2-A circuit of the 1950's Fender Princeton, a variation on the legendary Fender Champ they are a sound-alike just as much as a look-alike. This is a single ended Class-A all valve amp hand wired turret board construction classic amplifier that will be of use both in and out of the studio and great for home practice aswell as gigging. The 5w of power when it comes to a valve amp is equivalent to 25W transistor amp power so really packs some punch. The looks are pure 50's styling, from the tweed covering to the chicken head controls, super cool. Having been reviewed by a sound tech at Abbey Road Studios it has been described as a professional little amps good enough for any signed or unsigned artist or budding beginner looking for professional sound that won't break the bank. The amp itself as standard is driven by a single Ruby/Shuguang 6V6 tube in the power amp section. The preamp contains as standard a single Ruby/Shuguang 12AX7 preamp tube and the rectifier contains a 6Z4 rectifier tube for that authentic valve rectifier feel , a feature very rare in an amp of this price ' . Should you prefer a 12AT7 lo gain pre amp tube to help redce feedback (a popular choice for some harp players) I can do this for you upon request via the 'contact Honkin' Tom' feature at the top of the page or in the 'notes to seller' section in the Paypal checkout. This solidly made amp is sure to deliver endless classic Chicago tones you will have heard on countless classic recordings from the 1950's through to today without a doubt a worthwhile investment for any studio owner or enthusiast that just wants great tone at their lips. The Super Chumps 10" speaker allows for a greater bass responce and a broader vintage tone over similar size models with only an 8" speaker.